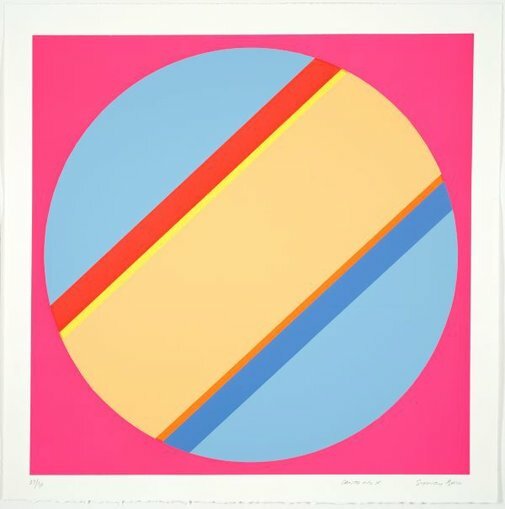 This series of screenprints revisits Sydney Ball’s ongoing series of ‘Canto’ paintings, drawings and prints, which he first developed in the mid-1960s while living and working in New York (1963-65 and 1969-7). The motif of hard-edged geometric forms and vibrant colours came from his experience of hard edge and colour field painting in America and his own investigations into the formal relationships between colour and symmetry; in 1968 he was quoted in an article by Laurie Thomas that he had been ‘…developing colour ideas and theories – the relationships of colour and investigations into spatial relationships – and became involved with the circle as a symbol of infinity’ (‘An artist fascinated by colour and space’ The Australian 28 September 1968). The title comes from ‘The Cantos’ poems by Ezra Pound. Colour has been the primary subject of Ball’s work for decades – when speaking about his ‘Stain’ paintings in a 1975 documentary he described them “… as a continuation of the early ‘Cantos’. I’ve never deviated from the original intentions of the early ‘Cantos’ to what I’m doing now. For me, the whole problem of a painting is the importance of colour. Style for me is quite secondary’ (‘Ten Australians’, 1975, ABC). In this latest series of screenprints, Ball worked closely in the studio with Michelle Perry, master printer at Marnling Press, from small pencil studies with colour swatches. In the process, he discovered metallic powders in the studio, which allowed him to experiment with colour to achieve silvers and other metallic shades. These modern materials and colours, not available to him when he commenced the series in the 1960s, gave Ball the opportunity to create new versions of the ‘Cantos’ that bring to the series an exciting energy and freshness, extending the artist’s preoccupation with colour relationships into new realms. Signed l.r.corner pencil, "Sydney Ball". Not dated. Sydney Ball: the colour paintings 1963-2007 , Penrith, 2008, 13-14, 15, 17, 21, 75. Sydney Ball survey 1965-1975 , Newcastle, 1975.